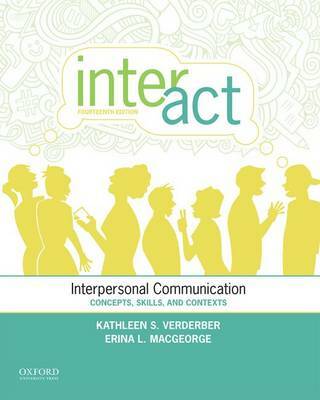 Author(s) Verderber, Kathleen S.; MacGeorge, Erina L.; Verderber, Kathleen S.; MacGeorge, Erina L.
Designed to help students explore interactions in both personal and professional domains, and develop the specific skills necessary to creating and maintaining healthy relationships, Inter-Act: Interpersonal Communication Concepts, Skills, and Contexts, fourteenth edition, retains the features that have made this book so successful: a theory driven and skills-based focus, an accessible tone and presentation, and a multitude of useful pedagogical tools. For this edition, new co-author Erina MacGeorge has brought her in-depth knowledge of current theory to bear on each chapter, thoroughly updating the material so that it reflects the current state of knowledge in the discipline.Lively and well-written, Inter-Act features numerous activities that enable students to relate their everyday experiences to their studies in communication. It also addresses readers' experiences of communicating across differences in individual identity, gender, and culture. With a strong focus on the importance of ethics, this leading text encourages students to develop their analytic abilities as they think critically about key concepts in interpersonal communication.